2.Optimize the OCR languages options. 3.Create PDF from Window Capture. 4.Create PDF from Selection Capture. 5.Create PDF from Screen Capture. 1. Supports adding text comments. 2. Fixed the crashing issue when switching the same font. 3. Fixed the crashing issue when saving the file after editing special characters. 1. Fix the crash issue when pasting text for multiple times. 2. Solve the problem of page disorder as moving the pages and inserting page numbers. 3. Fix the issue of appearance abnormality when making the radio button properties as default. 1. Support adding background to PDF files. 2. Fixed the image-cropping issue when inserting images. 3. Fixed some other minor bugs. 1. Wondershare PDF Editor Pro is renamed to Wondershare PDFelement and keeps the same functions. 2. Wondershare PDFelement has brand-new interface with brighter color and becomes more user-friendly. 3. 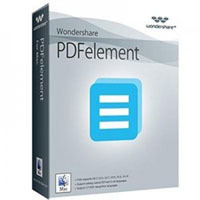 Wondershare PDFelement provides better results and rendering effects. 4. Wondershare PDFelement is expected for more improvements and upgrades in the near future. 5. Sign PDF files with hand-written signatures created in stamps. 4. Added expand and collapse features to bookmark. 6. Increased the annotation property presetting functions.